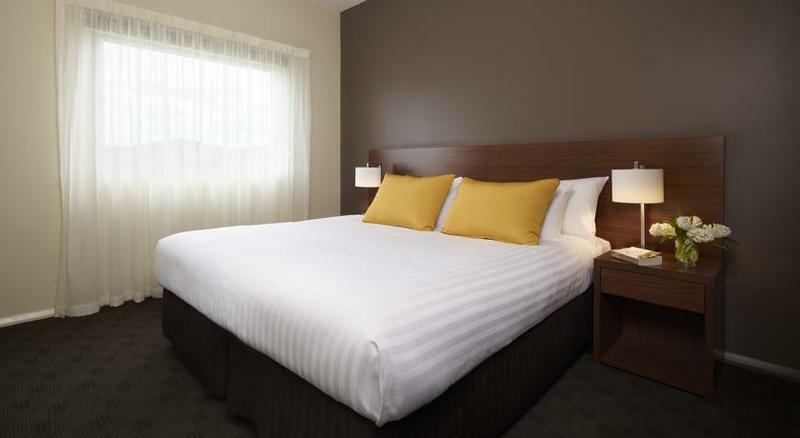 يقع Travelodge Hotel Hobart Airport في منطقة مشهورة للغاية في المدينة. هذا الفندق هو من الخيارات الشائع بين المسافرين. يمكن من هنا للضيوف الاستمتاع بسهولة الوصول إلى كل ما تقدمه هذه المدينة النابضة بالحياة. يوفر العقار بفضل موقعة الجيد وصولاً سهلاً إلى أهم معالم المدينة.
. إن Travelodge Hotel Hobart Airport حريص على توفير الراحة للنزلاء، فلا يوفر الموظفون جهداً في تقديم أفضل الخدمات وضمان حسن الاستقبال. يقدم العقار واي فاي مجاني في جميع الغرف, خدمة التنظيف يوميًا, خدمة غسيل ذاتية, خدمة سيارات الأجرة, مجهز لذوي الإحتياجات الخاصة لضمان الراحة القصوى لضيوفه. استمتع بوسائل الراحة الراقية في الغرف أثناء إقامتك هنا. بعض الغرف تتضمن تلفزيون بشاشة مسطحة, سجاد, غرفة معيشة منفصلة, حوض الاسترخاء, غرف لغير المدخنين لمساعدتك على استعادة طاقتك بعد يوم طويل. يمكنك الاستمتاع بالأجواء المريحة التي تقدمها مسار جولف - ضمن 3 كم, ملعب للأطفال, حديقة طوال النهار. مهما كانت دواعي سفرك فإن Travelodge Hotel Hobart Airport هو خيار ممتاز لإقامتك في المدينة. يرجى ملاحظة أن مكتب الاستقبال مفتوح على مدار 24 ساعة. Convenient location near Hobart airport with 5 minute drive. A very good hotel close to the airport. Clean well stocked rooms. Located on large property that invites a walk. The restaurant food was quite good but be prepared for quite a wait. It seemed that meals were cooked one table at a time no matter how simple the order. Great service. Good food in restaurant though they were closed for dinner on 2nd night due to kitchen major renovation. Very helpful receptionist both in the evening and the morning. The room was as anticipated - fairly basic but very comfortable and clean. Some movie channels and a little sewing kit/cotton buds/cotton wool pack would have been nice but otherwise fine. I enjoyed the quietness, the cleanliness and the lovely staff. I would be more than happy to stay here again in the near future. Parking was close and very easy to come and go. Room was very well appointed. The hotel was pretty new and very close to the airport. It is idea for those travellers who need to departing early or seeking value of money, coz it's located 20 mins driving distance to the city centre therefore, the room rate is cheaper than other hotels in city.But overall this hotel is good. The room is clean and big. Comfortable hotel and so very convenient to the airport when arriving late at night. Room was clean and Bed was comfortable. The aircon was dodgy , it was a little noisy. They provide free internet, but I was never able to get a internet connection. Enjoyed the complimentary continental breakfast. Free shuttle service between hotel and city centre also available at 9:15am and 3:15pm daily. If you do not drive, just need to concern about the transport as public transport is not available. Room is clean and staff is very nice. Great stay. 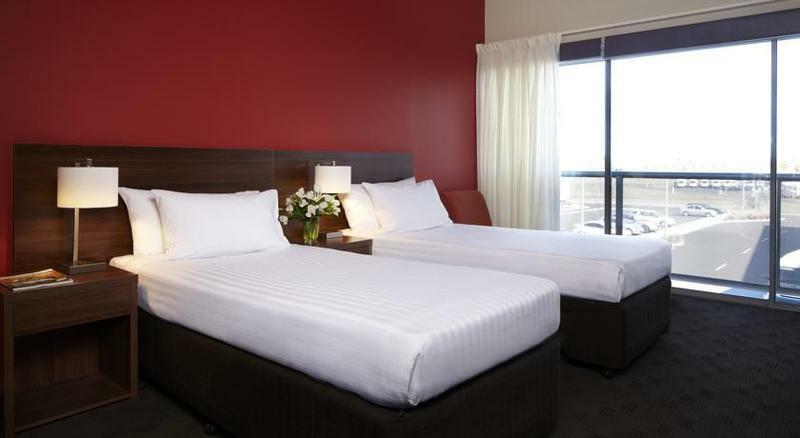 we booked a room for 3 gals (1 queen & 1 single)for 1 nite stay, super close to the airport and the room was very clean. there is a petrol station right next to the hotel, which is convenient when you need to fill up the tank before you drop the car off at the airport. this hotel is around 12-16km away from the hobart city. highly recommended when you need to catch an early flight the next day!!! stayed in a 2 bedroom for 1 night. one room was like a palace, the other one was bearable. the bigger room has a jacuzzi bathtub and that toilet was huge. nice couch area for watching tv and chilling out together. and also a dining area where we could have our meals together. kitchenette only has a microwave and sink, with cultery and utensils. however, there was no stove which was fine with us. they even have plates, bowls n salad mixing bowl. the bedroom has a door for privacy. the other room was pretty small but facilities was sufficient. shower. one factor why we decided to stay at this hotel is the complimentary shuttle services between the airport and the hotel. we stayed in the hotel on the last day of our trip. we returned our car the night before we flew off and they sent the minibus over to pick us, just needed to wait a couple of minutes. we had a 8am flight the next day and they drove us over at 0705. great service. saves us the hussle of arranging for a taxi and the cost saved as well. although it is slightly pricier than hotels in hobart city, we loved the experience there. A minute to HBA airport. Perfect for good rest before flight. We stayed here for our last night before leaving Hobart. The hotel had nice staff with good service and advice. It took only 5 minute drive to Hobart airport. Also, we had our seafood lunch nearby. 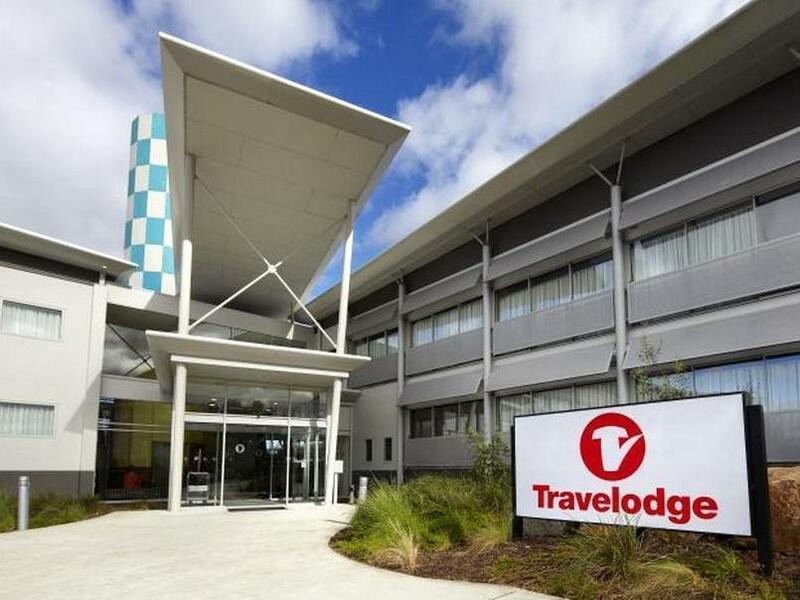 Having to catch an early flight the next day, it was so convenient to stay at Travelodge Hobart Airport. We spent a very comfortable night there before getting up for a continental breakfast and heading off in the complimentary shuttle for our flight. No rushing. Very civilised. We had an early flight in the next morning and thought an airport hotel would be convenient but unfortunately it is quite far from the hotel. You cannot walk there in the dark along the driveway for 30 mins. It is clean, has large rooms and has an old-world charm. Some rooms face a pub so there could be some chatter later at night when pub patrons leave. As hotels go in Australia, it is up there with its peers. Very quiet at night, but keep in mind you'll definitely need a vehicle to get to the hotel from the airport. Twin beds were comfortable but only sleep 1 person maximum. Heating and A/C both worked excellently, plus you can open a big sliding door (2nd floor room) to get more air if required. I like the fact that it is very to airport. Because I need to catch a morning flight, it is very convenient to drop off my car and take the shutter bus to airport without having to wake up exceptionally early. The facilities are good.